For many years, fluorescent lamps were virtually only the choice for providing lighting from a 12V battery. Modern LED technology provides smaller, lighter and more efficient solutions. 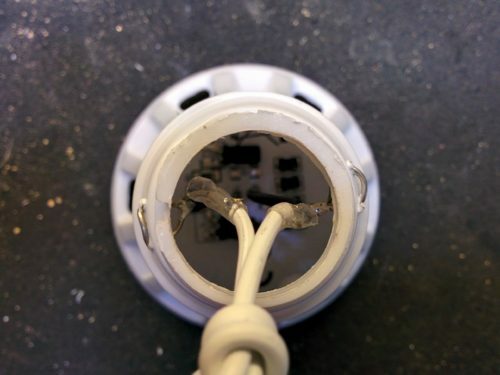 Many Far-Eastern suppliers on Ebay sell “12V White LED Camping Bulbs” for around £1, but being very low cost, these are not as efficient as they could be and have a very short lead. However, they provide a very cheap “case” for a better solution. The 5W version provides the right diameter for this design. 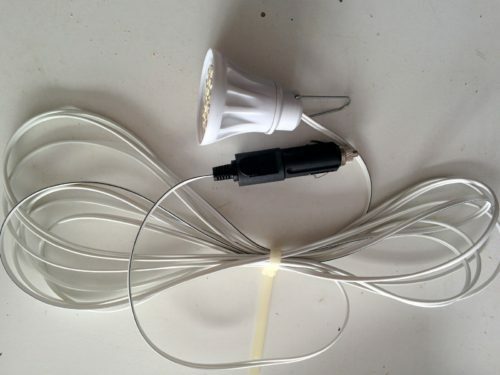 The first step in the conversion is to remove the diffuser, LED plate and wire, leaving just the white body and end cap. 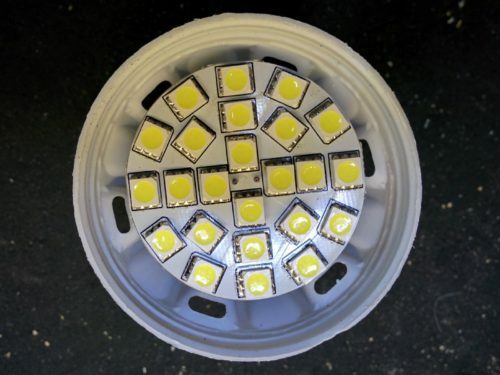 The light for this design uses a “G4 24SMD 10-30v DC 4.2W Cool White” LED module from Litecone. This is 44mm diameter, and will run from 10V-30V so doesn’t dim when the batteries are getting flat. The electrical connection is by two pins on the back of the PCB. These pins are removed, and replaced by two lengths of thick tinned copper wire with a bit of sleeving. Four 1mm holes are drilled at the top of the case, and the wires looped through to provide a mechanical fixing for the module. The LED module “floats” inside the case to provide optimum airflow – they do get warm! 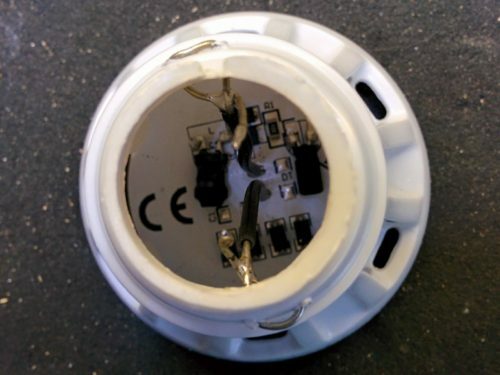 An inline switch (CPC PL10018) can be fitted if required, normally placed 2m from the lamp. 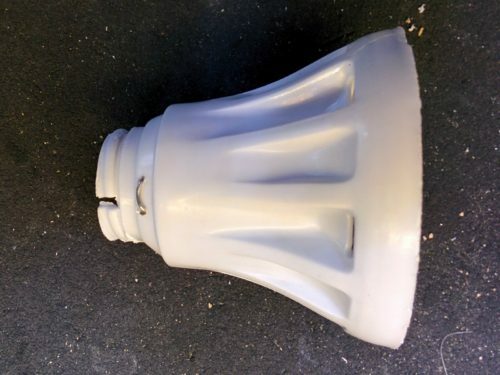 The total cost of a lamp is under £9 (in 2018). 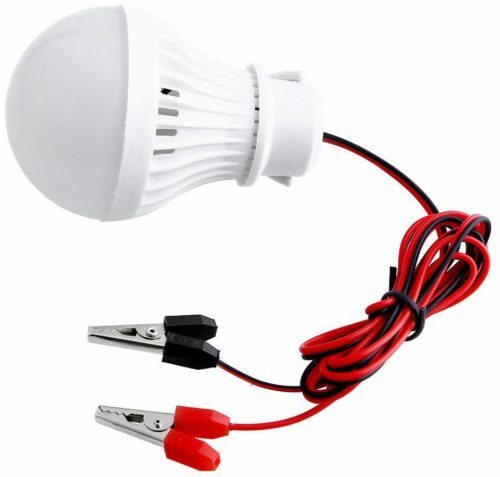 A ‘nicer but less efficient’ light could be made using a G4 24SMD 10-30v DC 4.2W Warm White LED module, also from Litecone.